Our thanks to Michal for the second of the ticket scans shown to the right - click it to see it in more detail. The final night in Germany for the Saucers' tour, and each show in the country has been met with a great audience reaction. 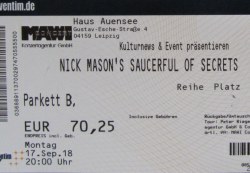 For this latest show on the tour, during his customary initial thanks and welcome to the audience, Nick said: "Well, as I hope you are aware, we are not the Australian Roger Waters, nor the New Zealand David Gilmour, I am Nick Mason, and these are the Saucerful Of Secrets. We're very happy to be here tonight, and we hope you enjoy yourselves as much as we intend to!"